An interview with Charles Netto. Have you ever eavesdropped on a coffee shop conversation? Every latte-sipping strangers around you has a surprising story to tell. In Eavesdrop: The Coffee Shop Show it’s okay to listen. Swallow-a-Bicycle Theatre’s audio play is performed during the coffee shop’s regular hours, without disrupting its operations. When you arrive, we’ll hand you wireless headphones that let you eavesdrop on six seemingly normal coffee-drinking patrons who each have burning secrets to share. After a whirlwind 45-minute performance that transports you to another world, you’ll remove the headphones to find yourself back in your local coffee shop… but you’ll never look at it the same way again. 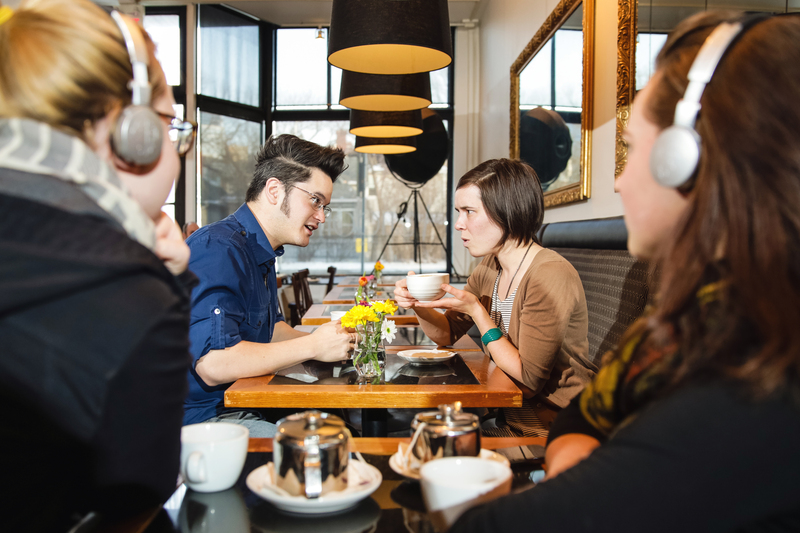 Why choose headphones as part of how the audience experiences Eavesdrop: The Coffee Shop Show? It was important for us to keep the coffee shop open and public, to cause the least amount of disruption possible. By using wireless headphones the coffee shop can stay open and we are able to truly immerse the audience in the world of the coffee shop. Remedy is definitely one of my favourite shops, but why did you decide to present your show at this particular venue? I went to school at the U of A and Remedy on 109 (in those days the only Remedy) was always one of my favourite coffee shop. From the tasty chai and curries, to the graffiti in the bathroom Remedy has always made me feel welcome as an artist and a laptop camper. Remedy also supports artists by hanging art and being a venue for the Found Festival. Eavesdrop: The Coffee Shop Show can be performed in different coffee shops, but we’re very excited that the Edmonton premiere will take place at Remedy on 109.